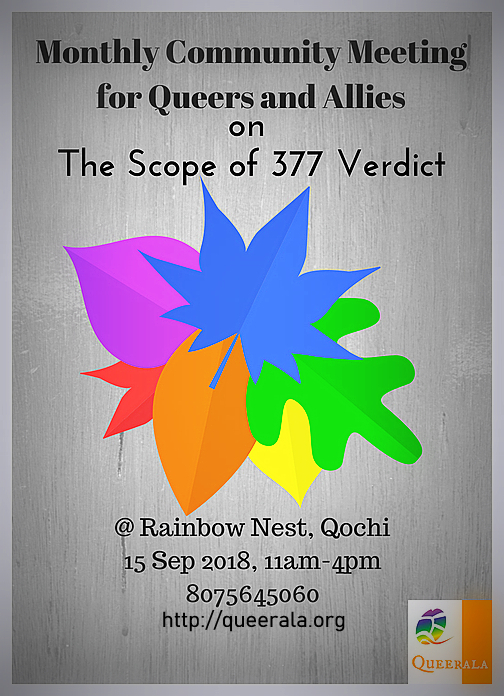 MCM (September 2018) on the Scope of 377 Verdict. This version of Queerala’ Monthly Community Meeting (MCM) would focus on understanding the relevance of Supreme Court verdict and its implications. The aftereffect of the verdict across areas of healthcare and policy making, possibilities of better forms of advocacy in educational spaces and workplaces also shall be discussed. We hope the community members share their responses on the recent verdict, in terms of Right to Freedom of Expression, Right to Life and Privacy and beyond. Certain recent cases of discrimination faced, from health care service providers and police, by the LGBTIQ friends in Kerala would also be discussed. We invite LGBTIQ community people and our allies for the meeting, which shall serve purpose on taking home insights on the scope of the verdict. Venue: Location shall be shared to those who confirm their participation. allies, india, Kerala, monthly community meeting, queer. Right to Love and Choose One’s Partner! When?